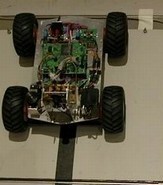 Sound in games and play with model layouts can be activated based on where the vehicles are, and what they do. The combination of a sound modules, Position system and our automaion framework allow you to make unendless combinations of how to let sound play a role. And also let sound disappear when it is too much. You can use any controllable sound modules or decoders with sound. 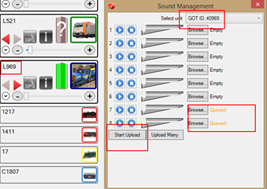 However, Gamesontrack provides our own sound module 1302764 with smal or large speaker. It has the advantage of having 8 individual sounds up to 25 seconds each with all sound to being up-loaded by the radio. You can pick you own sounds on the internet, MP3 or Wav files and let the GT-Xconnect up-load them to your module. The up-load proces runs without taking anything away or dismounting anything, the radio takes care. The figure shows the up-load function.